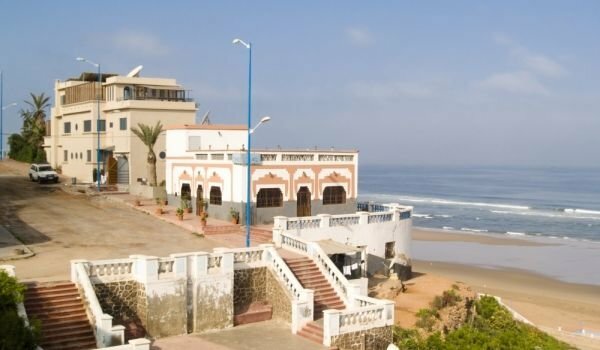 For lovers of Spanish culture, mixed with exotic sunny Africa, the city Sidi Ifni is a perfect destination. This is incredibly quiet and pretty little resort town has several hotels, port, market and very nice people. Perched on a cliff, about 150 km. south of Agadir, Sidi Ifni is an original piece of paradise in Morocco. This is the last Spanish colony in the country, and this is evident in urban architecture. Most of the buildings are beautiful Andalusian style and Art Deco. People here are extremely hospitable, probably as a consequence of the Spanish presence, which withdrew in 1969. In Sidi Ifni there are no great historical or cultural attractions, but this is the perfect place to indulge in active recreation, including silver beaches, crystal water and incredibly delicious food. Portions here are huge and always freshly prepared. The central city square is named Hassan II and on it are the Courthouse, the building of the Municipal Council, the royal palace and hotel "Bellevue", which has magnificent views of the coast and is the only area with a license for alcohol. If you like peace, you must pass through Beach blanche or white beach, located 20-30 km south of Sidi Ifni . This is a place with miles of white sandy beach, which is far from any city noise. The best time to visit Sidi Ifni is from February to November, when the weather is not so hot.